I accepted the invitation to review Java by Comparison: Become a Java Craftsman in 70 Examples (2018, The Pragmatic Bookshelf) because the premise of this book interested me. The book Software Craftsmanship: The New Imperative had a significant effect on me when I was a much less experienced software developer and I looked forward to reviewing Java by Comparison because of its connection with the concept of software craftsmanship and its examples being provided in the Java programming language. I was provided with the electronic version of the book and I chose the PDF format for my review. 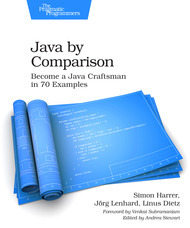 Java by Comparison is written by Simon Harrer, Jörg Lenhard, and Linus Dietz and has over 160 pages of substantive content (not counting prefaces, forewords, table of contents, etc.). Java by Comparison features nine chapters and the 70 cases covered span the first eight of those nine chapters. Java by Comparison uses the same format for eight of its nine chapters. Each of these eight chapters are divided into several items each and at least two code samples are presented for each item. The first code sample for each item is typically functionally correct code, but the second code sample for each item illustrates how that particular item's principle can be applied to improve that code. There are three samples of these items ("extracts") available on the book's web site to see what I'm attempting to explain here. Java by Comparison covers specific principles that fall into the areas of clean code, stylistic considerations, readability considerations, comments, naming, exception handling, unit testing, object-oriented design, and using Java's functional capabilities that were largely introduced to the language with JDK 8. Simple code examples are used in each item to contrast minimally sufficient code with improved code. The ninth and final chapter is different from the first eight chapters. That chapter has fewer code samples and more descriptive text of general practices experienced Java developers tend to adopt in areas such as static code analysis, build automation, continuous integration, logging, and working with concurrency. This chapter is mostly higher-level and provides a taste of these topics for the newer Java developer. Java by Comparison collects information useful to newer Java developers in a single location. There is a side note about "Multiple Returns vs. Single Return per Method" in the section on avoiding unnecessary comparisons. There is a side note about "Never Use Floating-Point Arithmetic for Money" in the section on using appropriate tolerance values in unit testing. Java by Comparison uses several different parts of the JDK API to illustrate its points. Most of the lessons discussed in Java by Comparison are ones that I've had to learn the hard way and I found myself agreeing with most of the recommendations (and I've even blogged on some of them). The format comparing working code with superior code is effective in illustrating the principle discussed in each item. The authors find a nice balance of small, simple code examples and just enough text to cover the point. Java by Comparison is polished and has very few grammatical errors or typos. This seems to be an increasingly rare characteristic of technical books. Code listings have color-coded syntax and shaded background in the PDF version of the book. PDF version provides links between pages that reference each other. Links to online resources work from PDF. An accessible errata is available. The text in Java by Comparison is easy to read, highly approachable, succinct, and well suited for those newer to Java. Java by Comparison makes recommendations, but is not overly prescriptive and on several occasions highlights that sometimes "best" is context-sensitive and can only be determined after trying different approaches. Although written by three different authors, the writing of Java by Comparison is consistent and uniform. Java by Comparison provides frequent references to books and online resources for additional details regarding the concepts it covers. Java by Comparison's "Bibliography" lists several of the most influential books and posts in Java and software development. I would have liked to have had access to Java by Comparison when I was still relatively new to Java. I remember reading the first edition of Effective Java and learning some from it, but Java by Comparison would have been more appropriate for my level of comfort with Java at that time. The "Acknowledgements" section of Java by Comparison provides insight into the intended audience. The authors started building "a collection of common issues" that students in their "Advanced Java Programming" class encountered. The "Who Should Read This Book" section of the book addresses the audience more directly, "This book is for people who are learning to program in Java at a beginner or intermediate level. It's also a classroom resource for teachers who coach new developers in their journey to become programmers." The authors add, "You should read this book after you’ve learned the basic Java syntax - after you're able to write small programs with conditions and loops and you know the basics of object-oriented programming." The authors even provide a FizzBuzz-based assessment for potential readers to determine if they have the minimum recommended Java ability to make this book useful to them. I agree with the authors' recommendations regarding who will benefit most from Java by Comparison. However, I would add that even more experienced Java developers might benefit greatly from reading Java by Comparison if they have not spent much time reading things such as Effective Java, Clean Code, Holub on Patterns, or other books or online media regarding writing Java more effectively. Many developers new to Java who have started feeling comfortable with its syntax and basic APIs often ask what is the next best book from them to read. Java by Comparison now gives me an easy answer to that question. I will recommend this book to developers new to Java as an appropriate book for them to read before moving onto Clean Code and Effective Java. Java by Comparison is also recommended for more experienced Java developers who have concentrated mostly on getting the job done in the past and would like to do a better job at writing code that is more than sufficient and is easier for the next developer who has to work with it. Java by Comparison applies a novel approach to presenting ideas for beginning and intermediate Java developers to learn techniques they can practice to become better Java developers and to write better code that will benefit others and themselves. There are three sample "excerpts" available to give a prospective reader an opportunity to determine if he or she likes the format and style of writing. There are listed below. I have also included links to others' reviews of Java by Comparison because we all have different tastes and experiences and it might be helpful for prospective readers of Java by Comparison to read what others have said about the book. "Split Method with Boolean Parameters"